Preparing for GATE exam gives shivering nights to a student, though one can crack the GATE exam with self-preparation as well. The only things required is the hard work, dedication, and self-confidence. Here, we will explain how to prepare for the GATE ECE. Final year is the ideal time to start preparing for the GATE ECE. This article will help you to crack the toughest of the exams with ease. GATE is an online examination conducted to assess the understanding of the candidates in undergraduate subjects related to their specialization or interest in the fields of Engineering, Technology, Architecture, and in several postgraduate subjects of science. Score obtained in GATE is considered for admission in various postgraduate programs in the most prestigious institutes in India like IITs, NITs, and centrally funded institutions. Similarly, many PSUs like IOL, NTPC, BHEL, etc. also consider the GATE score for the appointment of junior engineers. Engineering Mathematics: It comprises of Differential Calculus, Linear Algebra, Complex Variable, Numerical Methods, Transform Theory. Electronics and Communication Engineering: It comprises of Networks, Electronics Devices, Analog Circuits, Digital Circuits, Signals and Systems, Control Systems, Communications, and Electromagnetics. General Aptitude: It comprises of English grammar, Sentence completion, Critical reasoning, verbal deduction, word groups, and instructions. Each topic has several sub-topics. You need to go through the syllabus in detail to understand what you have to study and what not. Collect question papers of past 10 years’ and solve them 5-6 times. It will help you get an idea about the questions being asked in the exam. Solve the same question paper within a fixed time. It will help you to enhance your speed exponentially. Keep your basics strong and ideas clear. The questions asked in the GATE Exam are generally based on the principal ideas. Give importance to the subject textbooks than reference books. Refer very popular and the best reference books that are published only for GATE. Follow the syllabus strictly; you need not look beyond the GATE syllabus. Keep on preparing daily as per the schedule. Don’t squander your time examining stuff that is out of syllabus. Don’t lose your expectation and trust in planning. Don’t examine the questions just before the Exam at the Exam Center. Don’t begin your planning with hard subjects. Don’t waste your time in perusing every one of the books for a solitary theme. Try not to go by the trends of earlier years and answer questions. For ex., in CS 2012, for a score of 60, AIR was around #500, yet in CS 2013, for a score of 60, AIR is around #50. You may wind up scoring more negatives attempting to coordinate earlier year’s scores. Your half task is done here itself if you follow the above points. You should make sure to start with the easiest questions and proceed to the toughest ones in the exam hall. Don’t think a costly coaching will offer something extraordinary. They just try to keep the students abreast with a tight schedule. Smart students rely on self-studying for GATE rather than just coaching as self-studying explains most of the concepts from the base. Don’t attempt any question which you are not sure about. Some students exclude certain subjects during the preparation considering the low weightage. Though it seems a good decision, sometimes it backfires. You might get simple questions from the subjects you excluded and difficult questions from the subjects you studied well. Mathematics will have an immense effect on your scores. Around 30 marks (counting inclination) is truly simple to score. They are generally less troublesome and direct than subject questions. Read the standard textbooks that are recommended by the professors in your undergraduate program. Do some research on standard books used for the preparation of GATE exam. Though you will find many GATE preparation tips for ECE over the net, still do rely on the standard books as the students still prepare on the subject going by the hard notes. Solve 10–15 Questions Daily; don’t try to cover all the subject at once, as you cannot mug up all the things at once. Practice hard with Mock Tests; do prepare a minimum of 10-15 mock test for each subject during this period. The GATE ECE preparation strategy should include lots of mock test preparation. Review the question paper quickly. Clear the aptitude section at first. If your preparation is good, then the aptitude section will not take much time. After completing the aptitude section attempt all the simple questions and the questions which you can solve immediately. Don’t waste time and marks by attempting a question which you don’t know. Having a solid clear personality all through the exam is completely important. Question papers more often than not contain the difficult questions in advance to imprint your certainty. Simple questions get stirred up at the later part. So, continue proceeding onward regardless of the possibility that you needed to leave 5 questions on the run. While attempting the question paper, attempt the easiest one first and then go for the difficult one. This can be mastered at the time when you do GATE exam preparation for ECE. You can definitely go for preparing a timetable or can also follow the strategy listed below as how to prepare for GATE ECE exam. Allot seven days for each subject – this incorporates contemplating every one of the points, experiencing standard book back questions, learning up materials provided from the coaching institute and some internet studies. So total you need to sketch down a 12 weeks plan (3 months). Devoting an extra month towards the end to reexamine everything will help in final polishing work. During this time it is best to solve previous question papers and test series. So this together makes it a 4 month planning. If you are a person who does homework regularly without fail, then a months preparation would be sufficient. or else you must go for the 3-4 month schedule. Excessively numerous cooks ruin the stock. Quit hunting down arrangement tips excessively and begin planning. Last never the least, Don’t get nervous while attempting the examination. Remember, GATE ECE is not amongst the easiest nuts to crack, on the other hand, it is not that tough if pursued with dedication. Always prepare by taking short notes with the help of standard books, reference books, and the internet. Make sure you leave the preparation at the least 3 hours before the examination, so that you can be fresh at the time of examination. Have ample of sleep so that you can remain alert at the time of attempting examination. Don’t even think of studying hard the preceding night before the examination as that will only result in drowsiness, weak memory, and slow thinking in the examination hall. Make sure to revise for the last time before 6 hours, and at least 6 hours sleep in the preceding night, so that your body can refresh and you can think fast. It is helpful in answering the questions efficiently at the time of examination. Enter the examination hall with all the required stationery as well as make sure to carry your enrollment number, as it is the last thing which you can afford after this hard session of preparation for GATE ECE Exam. 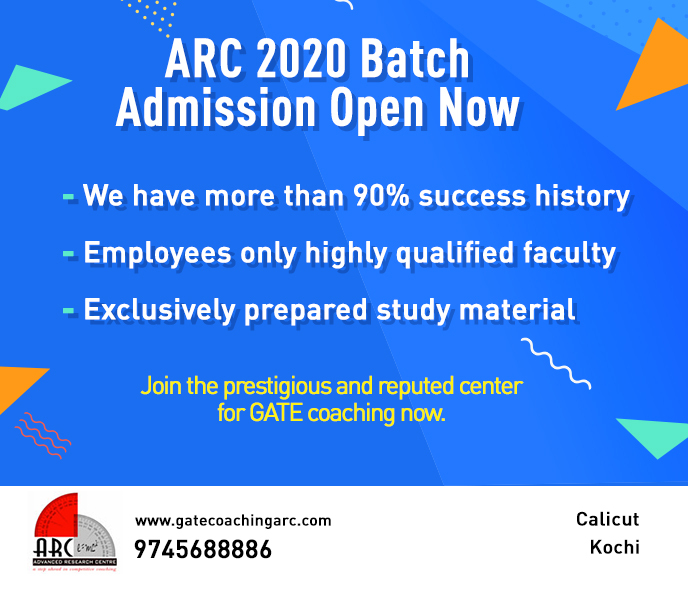 ARC Foundation is one of the best GATE Coaching centers in Calicut. 1000’s of students who enroll in our coaching center have successfully cracked the GATE and are into some of the best colleges in our country.